AVA Digital Awards has named the new Patterson Belknap website (PBWT.com) a Gold Winner in the 2016 international awards competition. PBWT.com is the second website produced by Great Jakes to be recognized with this award in 2016. AVA Digital Awards recognizes outstanding achievement by creative professionals involved in the concept, direction, design and production of media that is part of the evolution of digital communication. The competition is sponsored and judged by the Association of Marketing and Communication Professionals. Judges are industry professionals who look for companies and individuals whose talents exceed a high standard of excellence and whose work serves as a benchmark for the industry. 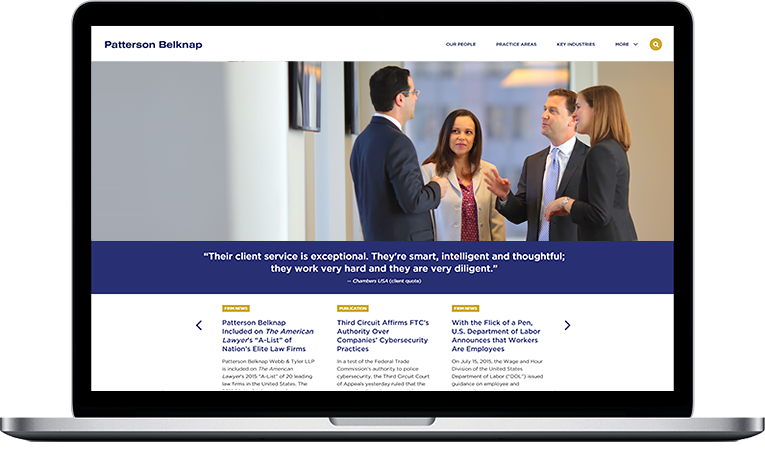 Patterson Belknap, one of the world’s elite law firms, engaged Great Jakes to create a cutting-edge website that would position the firm as a powerhouse, on par with the international behemoths with which it competes. Industry Focus – The website focuses on the nine “key industries” that comprise most of the firm’s caseload. Photo-driven Layout – The website features striking marquee photos of firm attorneys “in action.” These were taken during a five-day photo shoot that was art-directed by Great Jakes. Wider Format – The website achieves maximum visual impact by automatically expanding to fill the screen of extra-wide monitors (up to 1920 pixels wide). This is unlike most websites, which use a lowest-common-denominator approach (1024 or 1200 pixels wide). Related Content – The website automatically suggests additional content that is likely to interest the reader (and keep them surfing). Like all Great Jakes websites, the Patterson Belknap site features Attorney Microsites – a unique approach to lawyer bios that Great Jakes pioneered. For more about the Patterson Belknap website project, click here to read a case study.